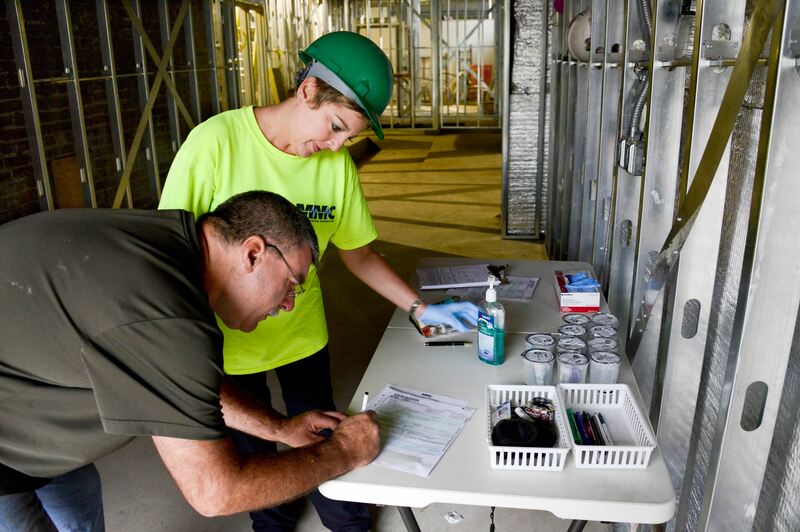 Jeff Fox, of Finleyville, Pa., signs off after his drug testing with Kelly Wilhelm at a construction site in the Uptown section of Pittsburgh. Fox is a carpenter with Easley & Rivers Construction of Monroeville. Wilhelm is with Mobile Medical Corp., a Bethel Park drug-testing company. As attitudes toward marijuana become more lenient and states authorize its use for medicinal — or even recreational — purposes, a long simmering debate over the efficacy of workplace drug testing has found a new flash point. Marijuana accounts for more failed workplace drug tests than any other substance, and the new laws have the potential of decreasing or eliminating employer testing for it. Defenders of drug testing maintain that employees who use drugs, including marijuana, have been found to miss more work, cause more accidents, change jobs more frequently and ultimately cost employers more money. Many of those defenders happen to be part of the drug test industry, comprising large diagnostic laboratories and smaller third-party companies, which has mobilized to oppose the wave of legislation and litigation that it expects to rise from the conflict between workplace policies and changes in laws. But voters in four states and the District of Columbia have voted to legalize recreational marijuana, and nearly half of states allow it for medical treatment. This month, Oregon’s recreational pot laws went into effect. Employers typically give drug tests as part of the hiring process, immediately after a workplace accident or at random times. “No single drug test is going to detect all use,” acknowledged Dr. Barry Sample, director of science and technology at Quest Diagnostics Employer Solutions. A Pennsylvania bill that would allow medical marijuana use has passed the state Senate and is under debate in the House. Democratic Gov. Tom Wolf has signaled support, and a Quinnipiac poll in March showed six out of of seven registered voters in Pennsylvania support it. 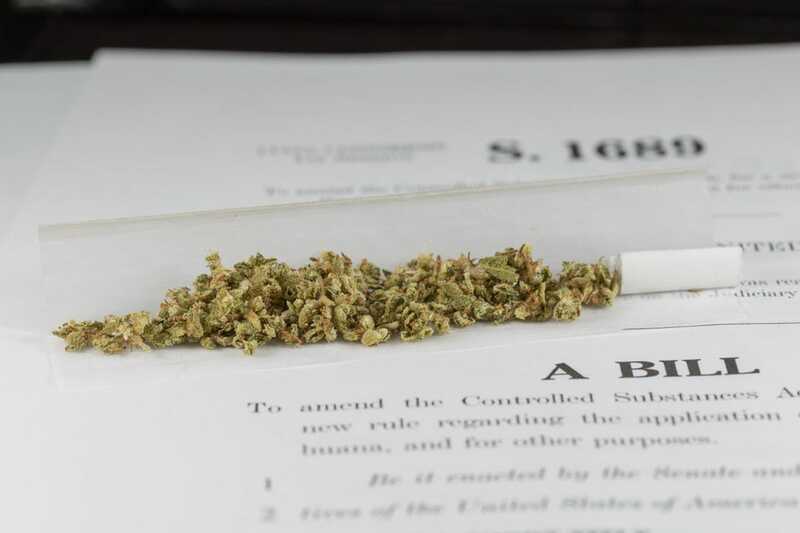 It has also aggregated all U.S. state bills attempting to change marijuana’s legal status and is soliciting donations to fund its own research to help businesses understand the risk of abandoning drug testing programs. The association’s Executive Director Laura Shelton tells business clients to follow federal regulations, which list marijuana as a Schedule I drug — an illegal substance with no acceptable medical use in treatment and a high potential for abuse. “Our advice at that if you want to maintain a safe and drug-free workplace, test for those drugs” outlawed under federal regulations, Ms. Shelton said. Experts and researchers have disagreed on the effectiveness of drug testing since the 1980s, when it began in earnest after President Ronald Reagan, a Republican, signed an executive order requiring it for federal employees. A separate U.S. Department of Transportation rule shortly thereafter added certain safety-sensitive jobs, such as truck drivers, railroad operators, pilots and pipeline workers. The standard test collected urine samples and flagged those that showed use of any one of five drugs: marijuana; cocaine; amphetamines and methamphetamines; opiates; and phencyclidine or PCP. Private sector employers outside of those requirements soon followed suit. In a 1987 survey, the American Management Association found 21 percent of major U.S. firms had testing programs. By 1996, that had risen to 81 percent. In 2014, one of the largest clinical laboratories, New Jersey-based Quest Diagnostics, tested 9.1 million urine samples — 6.6 million for employers who chose to institute drug testing programs. That compares with 7.6 million tests in 2013, with 5.6 million from workplaces who instituted drug testing policies. It is difficult to tie drug testing numbers directly to employers’ appetites for such services because the number of tests given is most dependent on hiring trends; the more people that businesses are hiring, the more drug tests are typically done. The number of failed drug tests has fallen nearly every year from a rate of 13.6 percent in 1988 to 3.9 percent in 2014, according to Quest. Most of that decline happened in the early years of drug testing; in the past decade, the rate has stayed mostly flat. Barry Sample, director of science and technology at Quest Diagnostics Employer Solutions, said the fact that federal data shows that workplaces without testing programs have seen a bigger increase in current drug users confirms the deterrent effect. That “really reinforces for those employers why they should continue to remain vigilant and not relax,” he said. Dave Daquelente, director of labor management & operations at Mobile Medical Corp., a Bethel Park drug testing service, said Pittsburgh-area businesses are demanding the tests more than ever and asking for expanded tests for opiates and amphetamines to counter a trend of prescription drug abuse involving substances such as Vicodin and Oxycontin. But privacy groups have questioned whether businesses are realizing the promised results. The American Civil Liberties Union criticized much of the data the drug testing industry has cited, instead backing a 1994 National Academy of Sciences study that found no evidence that marijuana use was any more of a workplace detriment than alcohol. Michael Frone, senior research scientist at the State University of New York at Buffalo, said there has been no credible evidence that testing programs deter workers from using drugs. Rather, heavy drugs users may go to workplaces without testing programs and others may simply use less frequently to avoid detection. Mr. Frone, who wrote the 2013 book “Alcohol and Illicit Drug Use in the Workforce and Workplace,” also said little research has directly assessed the effect of testing programs on productivity and attendance. Even if employees fail a test, he added, it doesn’t prove that they were unproductive on the job. “A positive drug test provides no information on when an illicit substance was used, how often or how much is typically used or if the person was or has ever been impaired at work,” he said. Drug testing’s supporters and critics both agree that changing marijuana policies pose a threat to the practice. “For an employer who has facilities in several different states, it makes it difficult to have a uniform policy when you have multiple state with different laws,” said Clare Gallagher, a labor and employment partner at Eckert Seamans Cherin & Mellott, a Downtown firm that last November created a regulated substances practice group. Mr. Daquelente said business clients of Mobile Medical Corp., particularly those spread across the country, are confused. Under Pennsylvania’s medical marijuana bill now being considered, employers would not be allowed to fire employees who are using marijuana off work hours and with a valid doctor’s recommendation. Employers would retain the right to fire marijuana patients if they are intoxicated on the job. Robert DuPont, president of Rockville, Md.-based Institute for Behavior and Health Inc., thinks the U.S. Supreme Court will ultimately have to reconcile the disagreement between state and federal laws. “There’s a conflict issue around privacy and productivity and concern about worker’s health,” Mr. DuPont, who was a director of the National Institute on Drug Abuse in the 1970s. Policy analysts and lawyers said, at least in the short-term, employers can expect the courts to rule in favor of federal law. Last month, the Colorado Supreme Court unanimously affirmed that Dish Network, as a private employer, had the right to fire an employee for failing a drug test, despite that employee’s legal right to use the drug in that state. In Pennsylvania workplaces that have federally regulated jobs, such as manufacturing plants and energy production, some employers have said they struggle to find enough applicants who can pass drug tests. A survey last year commissioned by the Pennsylvania Manufacturing Association found as many as a third of all applicants either fail drug tests or fail to show up for them. “The fact that 19 percent refuse to take drug tests as a condition of employment and 16 percent fail these tests raises a red flag,” it read. Unemployment advocates have denied that there is a hiring issue. Daniel Moore: [email protected], 412-263-2743 and Twitter @PGdanielmoore.